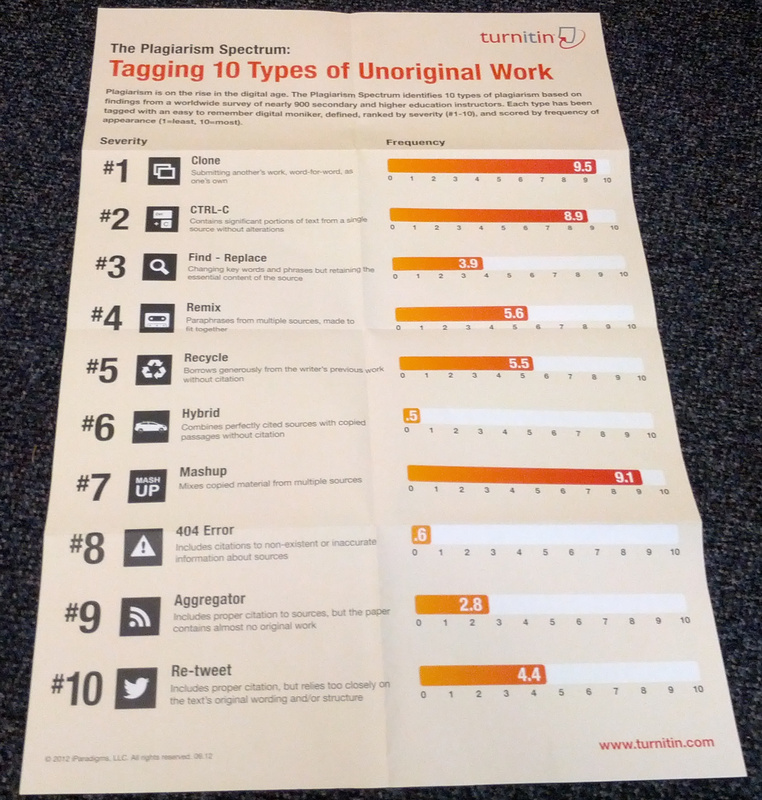 I am about to criticize and show examples from a copyright poster (or, for you new-fangled kids, an infographic) I received in the mail today from Turnitin, the anti-plagiarism company. Fair dealing y’all. Well, I have some problems with this. Let’s zoom in on the areas I find troublesome. Remixing is the 4th most nefarious form of plagarism, and mashups are #7…at least according to these 900 teachers and instructors. This saddens me because I happen to consider these two activities some of the most creative and original cultural acts happening today. And to think there are 900 some instructors and teachers out there who do not recognize the creative value and sheer amount of work it takes to create something new and original out of what existed before. Quite frankly, it astonishes me that in this day and age, remix and mashups are thought of as plagiarism. I am of the school that everything is a remix. Elements of reuse have always been present in creative work, even though the borrowing may have been framed in terms of “tradition,” or “influence.” Artistic and scholarly works build on the work of others. Yet, according to this study, we in education consider these acts of stealing; of unoriginal thought. Plagiarism. Laziness. Look at how lazy these remix people are. They work in bed in their pyjamas for crying out loud. No good can ever come out of that. If this is the true and accurate sentiments of educators in general – that remix is, in fact a form of plagiarism – then it makes me realize just what kind of uphill battle we might face here in British Columbia as we move towards creating and modifying Open Textbooks. The challenge being that if educators have this underlying core value that remixing someone else’s content to create something new is plagiarism, then they are coming into the open text book project with the preconceived notion that we have to build something from scratch; reuse is not an option because it is plagiarism. For me, this is the wrong way to approach an open textbook project. In order for the open textbook initiative to be successful, I think we need educators to come to the table with an open mind about reuse and remixing existing materials; to modify already existing open textbooks and openly licensed content to fit their specific needs. Not only do I think that starting from scratch is an arrogant place to begin (we are the only ones who know best), I think that if we try to recreate the wheel and start from scratch, we start at the bottom of the hill and put a big boulder in the way. Anyone who has written anything at length knows that it is much easier editing and modifying than staring at a blank piece of paper in the typewriter. are practices being painted with the plagiarism brush. A retweet serves many purposes, not the least of which is attribution. If someone retweets something that I send out and keeps my Twitter handle in the tweet, I am notified. It is a signal to me that they find what I tweeted valuable – so valuable that they wish to share it with the people in their network. For the person being retweeted, this underlying message you receive when someone retweets one of your tweets is that the people in your network find that type of content valuable. It is a prompt to share more. We all know how important knowing your audience is in communication and writing, and a retweet is a signal back to the original source that someone in the audience found the content valuable, please share more like this. Retweets serve an important function in that it helps me know my audience. Aggregation is, in essence, curation, a skill that I think is incredibly important in education. There is great skill to being a good curator of resources; a filter. I value the curators in my network. As educators, we constantly curate resources. It is one of the core learning activities we do – vet resources for our learners and point them in the direction of what we think is important. This is what aggregations is all about. But the biggest problem I have with this poster is that it brings all of these things together in one handy, scary resource, and makes these practices appear fraught with danger, when in fact, I believe these are core skills required to create understanding in today’s world. This poster is being sent out to other educators like myself in the hopes that it will get posted in a hallway or office so that other educators will see this. The underlying message they take away after viewing this poster is that these practices: Remix, Mashup, Aggregation and Retweet are riddled with risk (thanks, Tracy for helping me articulate this). That whatever positive purpose they may serve in an educational context, the risk is not worth it. And I fundamentally disagree with that. So, I am going to hang this poster in my office and I am going to use it to trigger a conversation. But I am going to modify it a bit. Remix, Mashups, Aggregation, Plagiarism oh my by Clint Lalonde is licensed under a Creative Commons Attribution 4.0 International License. Having come across the original article before your reaction to the poster, in the context of the full article I read its purpose quite differently than you. Often educators treat every instance of "plagiarism" exactly the same and call for "zero tolerance" with harsh penalties across the board for anyone caught, whether the student "cloned" or "retweeted." I thought this graphic provided a nice opportunity for the very discussions you raised – that not at all instances are the same, and many directly reflect normal, socially acceptable and encouraged behaviors in the modern non-academic world. It's important for students to learn the different expectations and norms for different contexts in a non-judgmental and non-punitive environment. Hi Robin. Thanks for your comment and for that contextual perspective. I have not read the original article (I admit I had little appetite to do so after seeing the poster and then being greeted with an email paywall when I got to the Turnitin site), but your comment has made me curious to go look. If the poster provokes conversations about the nuanced world of copyright, plagiarism and emerging norms of participatory digital practices, then that would be a great outcome. Unfortunately, the way the issues are framed on the poster already sets the stage for anyone who reads it to be in a mindset that these are negative acts. For example, the big, bold title 'Tagging 10 Types of Unoriginal Work" immediately makes me think that what I am reading is a list of activities whose output should be considered "unoriginal", and from where I sit that is not true, especially when speaking of activities like remix and mashups..
An even greater concern for me from your comment is that this poster is not an accurate representation of the larger article because there should be a congruence between that article and this infographic. Each should be able to stand on their own, speak the same message and deliver the same conclusion. I am off to read the article (thanks to your comment). I'm very interested to see the entire context to see if there is congruency. Does anyone know if college and university students were ''asked' (surveyed) about the open textbook project? I sure hope the e-texts will be available in a format that faculty and students will want to use (PDF, EPUB). BCcampus has been posting a series of Q&A's about open textbooks and the open textbook project they are coordinating here in BC. You can check out those 3 blog posts for some more info on what is being planed & how the process might work. It is there. Nice. Thanks for that….and for cluing me into the fact that Diigo caches! That is useful to know. I'd like a copy of your remixed poster 😉 As Brian notes it reeks of expanding the market for their services, creting a surplus of something which does not exist. I would think though, that in reading the fine print, they are not saying all remix/mashup/aggregation is unoriginal, but the way they see it done in written papers, that is the realm they are looking at. But egads, do not color me as defending them. 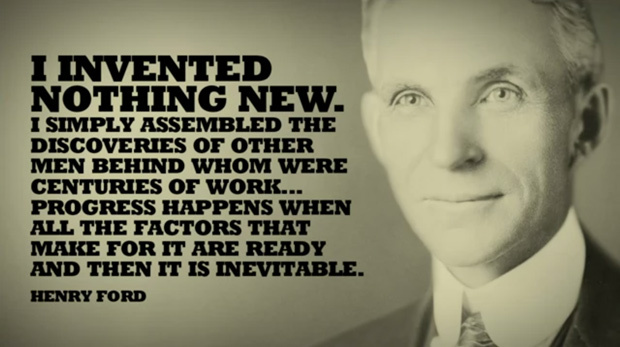 Frankly the whole notion of "originality" is properly harpooned, deflated, and bured by Kirby Ferguson's epic series, especially when he talks about ideas, inventions, discoveries as always building on the work of others. To me, the best course is a counter poster. Love that series from Kirby Ferguson. And the RIP documentary by Brett Gaylor, which I just watched again recently. Both are well worth the time. Funny you should mention that point because I talked with my office mate & colleague Tracy Kelly about that same point as I was writing this post – that Turnitin are looking at this issue through the lens of the written work as that is what they deal in. She was the one who made the point that even if that is the case, the way it is presented in the poster casts enough of a shadow of a doubt over the practices of remixing, mashups, aggregation and retweets that it could be a barrier for faculty who are on the fence and prevent them from actively engaging in these practices. Tracy’s point is sharp and dead on. They are tagging terms like “remix”, “mashup”, “aggregation”, and “Re-Tweet” as malignant acts, and fetishizing some idealized hermetic idea of “the written work” in doing so. A whole other layer of FUD. Why do us educators keep doing business with companies that hate the web? Love the idea of the modified poster as a way to generate further discussion, good on you. In terms of the BC Open Textbook project, this is definitely a challenge and one of the biggest misconceptions we already face (not really helped by the original announcement.) We don't intend (nor do we think it either realistic or even desireable) that 40 new open textbooks get created _ex nihilo_. A good portion of those we hope will be adoptions/adaptions by faculty in BC of some of the great quality examples that already abound. But you are right; this is already an uphill battle – copyright was an arcane topic at the best of times and has only gotten more confusing for faculty. 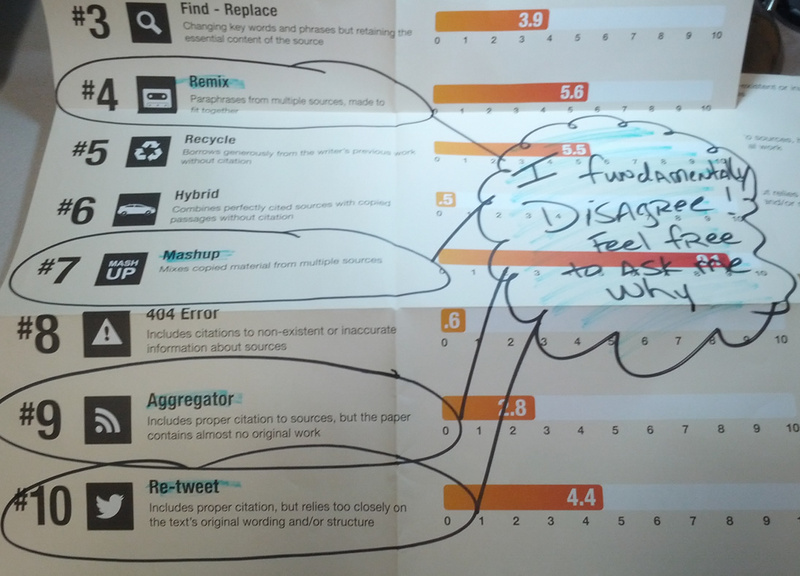 Clearly turnitin (and commercial publishers, amongst others) see the benefit in keeping the issue muddy and stirring the FUD in an already contentious and confusing space. Some new artwork for the beige hallway of bland, although I must say that Tracy Kelly's skillful artistic hand & our new graphic facilitator/ID Beth Cougler Blom have been making the CTET hall walls come alive lately with useful doodles & notes. If there has ever been a project in BC that has the potential to showcase the value of remix on a systematic scale, it's the open textbook project. Of all the ways to introduce the concepts of reuse and remix to faculty who are not familiar with the concepts, open textbooks feels like the most accessible – and one that students are clamoring for. If there is one thing I have learned from working with faculty for many years, it is that they listen to their students. And students want these. I love this post for all sorts of obvious reasons (not least, ashamed to say, for the unexpected ego-boost I got halfway through reading it) — and I hope your modified poster generates some good discussions with your colleagues. I’d add the dubious ethics of a company that relies on plagiarism fear for its revenue sending “helpful” guides to instructors that play on fear. And via an explanatory infographic that simply perpetuates confusion. To name but one, can anyone explain to me what difference there is in their definitions of “remix” and “mashup”? If my aging eyes read correctly, they assert a full copyright for their “guide” yet appropriate terms such as “Re-Tweet” -if there is ownership for that one, sure it lies elsewhere (clue: look at the corporate logo, which I doubt Twitter would want included here). And where do they cite their own sources? Did they conjure this tiresome collection of misguided clichés wholly on their own from the aether? It's the same type of fear-based marketing companies use to convince parents that their child will never be good enough, smart enough or safe enough. They identify problems you didn't even know you have and voila, magically have a solution to. Nice catch – didn't even think about the Twitter logo. And I, too, would like to see an actual reference back to the study they cite.